At the outset, we want to be clear that we are not questioning the valuable role that talented and dedicated psychologists play in the military, nor certainly the importance of providing our soldiers and veterans with the best care possible. As long as our country has a military, our soldiers should be prepared to face the hazards and horrors they may experience. Military service is highly stressful and psychological challenges and difficulties understandably arise frequently. These issues are created or exacerbated by a wide range of features characteristic of military life, such as separation from family, frequent relocations and, especially, deployment to combat zones with ongoing threats of injury and death and exposure to acts of unspeakable violence. The stress of repeated tours of duty, including witnessing the loss of lives of comrades and civilians, can produce extensive emotional and behavioral consequences that persist long after soldiers return home. They include heightened risk of suicide, post-traumatic stress disorder (PTSD), substance abuse and family violence. Although its advocates prefer to describe CSF as a training program, it is indisputably a research project of enormous size and scope, one in which a million soldiers are required to participate. Reivich, Seligman and McBride write in one of the special issue articles, "We hypothesize that these skills will enhance soldiers' ability to handle adversity, prevent depression and anxiety, prevent PTSD and enhance overall well-being and performance" (p. 26, emphasis added). This is the very core of the entire CSF program, yet it is merely a hypothesis – a tentative explanation or prediction that can only be confirmed through further research. There seems to be reluctance and inconsistency among the CSF promoters in acknowledging that CSF is "research" and therefore should entail certain protections routinely granted to those who participate in research studies. Seligman explained to the APA's Monitor on Psychology, "This is the largest study – 1.1 million soldiers – psychology has ever been involved in" (a "study" is a common synonym for "research project"). But when asked during an NPR interview whether CSF would be "the largest-ever experiment," Brigadier General Cornum, who oversees the program, responded, "Well, we're not describing it as an experiment. We're describing it as training." Despite the fact that CSF is incontrovertibly a research study, standard and important questions about experimental interventions like CSF are neither asked nor answered in the special issue. This neglect is all the more troubling given that the program is so massive and expensive and the stakes are so high. It is highly unusual for the effectiveness of such a huge and consequential intervention program not to be convincingly demonstrated first in carefully conducted, randomized, controlled trials – before being rolled out under less controlled conditions. Such preliminary studies are far from a mere formality. The literature on prevention interventions is full of well-intentioned efforts that either failed to have positive effects or, even worse, had harmful consequences for those receiving them. For instance, in the 1990s the DARE (Drug Abuse Resistance Education) substance abuse prevention program was administered in thousands of elementary schools across the US, at a cost of many hundreds of millions of dollars. Yet, evaluations of DARE rarely found the desired effects in regard to reducing young people's later substance use (e.g., see this and this summary). In response, DARE was modified in the last decade; however, subsequent evaluation found that the revised program actually increased later alcohol and cigarette use in those who received it compared to controls. Similarly, criminal justice researcher Joan McCord has demonstrated how well-meaning programs have caused actual harm. She conducted a 30-year follow-up of a classic delinquency prevention program. Those participants randomly selected for intervention, but not matched controls, were provided with extensive enrichment, including mentoring, counseling and summer camp. Among the matched pairs who differed in outcomes decades later, those who received the intensive assistance were more likely to have been convicted of serious street crimes; were more frequently given a diagnosis of alcoholism, schizophrenia or manic depression; and on average, died five years younger. Other studies of criminal justice interventions have also uncovered unanticipated, deleterious effects. Given this well-known record, it is especially concerning when a major intervention is rolled out for thousands – or hundreds of thousands – without careful prior examination, including an investigation of potential negative effects. The special issue of the American Psychologist gives no indication that preliminary studies of CSF were conducted. Also problematic, the CSF program is adapted primarily from the Penn Resiliency Program (PRP) where interventions were focused on dramatically different, nonmilitary populations. Even with these groups, a 2009 meta-analysis of 17 controlled studies reveals that the PRP program has been only modestly and inconsistently effective. PRP produced small reductions in mild self-reported depressive symptoms, but it did so only in children already identified as at high risk for depression and not for those from the general population. Nor did PRP interventions reduce symptoms more than comparison prevention programs based on other principles, raising questions as to whether PRP's effects are related to the "resilience" theory undergirding the program. Further, like many experimental programs, PRP had better outcomes when administered by highly trained research staff than when given by staff recruited from the community. This raises doubts as to how effectively the CSF program will be administered by non-commissioned officers who are required to serve as "Master Resilience Trainers." Regardless of how one evaluates prior PRP research, PRP's effects when targeting middle-school students, college students and adult groups can hardly be considered generalizable to the challenges and experiences that routinely face our soldiers in combat, including those that regularly trigger PTSD. In an inadequate attempt to bridge this gap rhetorically, CSF proponents describe PTSD as "a nasty combination of depressive and anxiety symptoms" (Reivich, Seligman and McBride, p. 26). In fact, PTSD involves a far more complicated cluster of severe symptoms in response to a specific traumatic event, including flashbacks, partial amnesia, difficulty sleeping, personality changes, outbursts of anger, hypervigilance, avoidance and emotional numbing. The voluntary consent of the human subject is absolutely essential. This means that the person involved should have legal capacity to give consent; should be so situated as to be able to exercise free power of choice, without the intervention of any element of force, fraud, deceit, duress, over-reaching or other ulterior form of constraint or coercion; and should have sufficient knowledge and comprehension of the elements of the subject matter involved as to enable him to make an understanding and enlightened decision. Disturbingly, however, this mandatory participation in a research study does not violate Section 8.05 of the APA's own Ethics Code, which allows for the suspension of informed consent "where otherwise permitted by law or federal or institutional regulations." Despite the APA's stance, we should never forget that the velvet glove of authoritarian planning, no matter how well intended, is no substitute for the protected freedoms of individuals to make their own choices, mistakes and dissenting judgments. Respect for informed consent is more, not less, important in total environments like the military where individual dissent is often severely discouraged and often punished. More broadly, the 13 articles fail to explore potential ethical concerns related to the uncertain effects of the CSF training itself. In fact, the only question of this sort raised in the special issue – by Tedeschi and McNally in one article and by Lester, McBride, Bliese and Adler in another – is whether it might be unethical to withhold the CSF training from soldiers. Certainly, there are other ethical quandaries that require serious discussion if the CSF program's effectiveness is to be appropriately evaluated. For example, might the training actually cause harm? Might soldiers who have been trained to resiliently view combat as a growth opportunity be more likely to ignore or underestimate real dangers, thereby placing themselves, their comrades or civilians at heightened risk of harm? Similarly, by increasing perseverance in the face of adversity, might the CSF training lead soldiers to engage in actions that may later cause regret (e.g., the shooting of civilians at a roadblock in an ambiguous situation), thereby increasing the potential for PTSD or other post-combat psychological difficulties? Or, might the resilience training lead some to overcome, for the time, the disabling effects of traumatic episodes and thereby increase the likelihood of their redeployment to situations with further risk of serious disability? The likelihood of these eventualities or other negative effects, is unknown. But certainly they are sufficiently plausible – as plausible as McCord's unexpected findings, noted earlier, of intensive counseling and summer camp leading to increased crime, mental illness diagnosis and early death among participating youth – that they cannot legitimately be ruled out a priori. These possibilities increase the ethical responsibility of those promoting CSF to conduct pilot studies, carefully monitor them for possible negative effects upon soldiers or others, submit the program to careful ethical review and seek informed consent. It is also important to note here two controversial aspects of the CSF program that have already received attention from investigative journalists. First, Mark Benjamin has raised provocative questions, not yet fully answered, about the circumstances surrounding the huge, $31 million no-bid contract awarded to Seligman ("whose work formed the psychological underpinnings of the Bush administration's torture program") by the Department of Defense for his team's CSF involvement. Benjamin notes that the government allows sole-source contracts only under very limited conditions. The Army contract documents note that "there is only one responsible source due to a unique capability provided and no other supplies or services will satisfy agency requirements." But as we have detailed above, public claims about the effectiveness of the PRP and its superiority to alternative prevention programs are significantly overstated, casting doubt upon the rationale for awarding the sole-source contract. Second, Jason Leopold and others have raised serious questions about the "spiritual fitness" component of the CSF program, which appears to inappropriately promote a religious worldview as an important path to greater resilience and purpose. The special issue article by Pargament and Sweeney confirms the legitimacy of this concern. It includes a range of theologically oriented terms and references and it specifically identifies the Army's chaplain corps as a resource "to assist individuals in their quests to develop their spirits" (p. 61). CSF draws heavily on "positive psychology" in aiming to reduce the incidence of psychological harm resulting from combat and post-combat stress. The field of positive psychology has grown dramatically over the past decade and has many exuberant supporters and evangelists. Rather than focusing on distress and pathology, they emphasize human strengths and virtues, happiness and the potential to derive positive meaning from stressful circumstances. Few would dispute the benefits of broadening psychology's purview in this way. But writers such as Barbara Held, Barbara Ehrenreich, Eugene Taylor and James Coyne have offered compelling critiques of positive psychology, including its failure to sufficiently recognize the valuable functions played by "negative" emotions like anger, sorrow and fear; its slick marketing and disregard for harsh and unforgiving societal realities like poverty; its failure to examine the depth and richness of human experience; and its growing tendency to promote claims without sufficient scientific support (e.g., the relationship between positive psychological states and health outcomes or the mechanisms underlying "posttraumatic growth"). These and related concerns are directly relevant to CSF. As described by Cornum, Matthews and Seligman in the special issue, the CSF program aspires "to increase the number of soldiers who derive meaning and personal growth from their combat experience" (p. 6). But in many ways, the technocratic language of military training programs and the positive psychology strategies that characterize the CSF program appear inadequate for the task. Activities such as the "three blessings exercise," in which the individual reflects on what went well that day and why, seem ill-suited for encouraging and supporting the deep questioning and open exploration of existential issues that often arise for soldiers facing extreme circumstances. By all indications, the program's positive psychology orientation also fails to scrutinize those very institutions that subject recruits to potential trauma in order to create people sufficiently hardy to engage in death-defying and death-inflicting experiences. In this regard, it is worth noting how special issue authors Peterson, Park and Castro briefly discuss the lower trust scores of female soldiers on the CSF program's Global Assessment Tool (GAT), which measures psychological fitness in four domains (social, emotional, spiritual and family). They interpret these results as suggesting "Female soldiers do not feel as fully at ease in the Army as do male soldiers," and they recommend further research to "understand the needs and challenges of female soldiers and to help them attain the same morale as male soldiers, which perhaps would reduce attrition among them" (p. 15-16). What goes unmentioned is that the extremely high rates of sexual assault on women soldiers, condoned or covered up by others higher in rank, is clearly a source of distrust and trauma – and it calls less for building a positive, resilient outlook among the victims than for recognition of how the commonplace victimization of women in war should be vociferously prevented. In important ways, key lessons of humanistic psychology are also regrettably overlooked in the CSF program. For many soldiers, combat awakens questions regarding the meaning of life and of its worth, which can become more persistent after returning home. Too often, our veterans face anomie, lack of community and the replacement of caring ties with the competitive values of marketability when their military service is over. Humanistic and related perspectives more directly and fully attend to this void, the emptiness of contemporary society that increases the difficulties in recovery from trauma, than does positive psychology. Because of the limitations of quantitative psychology to date, the data for phenomena of this type are more frequently found in stories than in self-report inventories such as the GAT. Limited data encourage a limited view of the phenomenon of PTSD and of any resilience that is based upon denial. In contrast, it is through revelations such as the Winter Soldier testimonies of US veterans and active duty soldiers from Afghanistan and Iraq, through studies of the phenomenology of returning soldiers by Daryl Paulson and Stanley Krippner or accounts of soldier participants in US torture as relayed by journalists Joshua Phillips and Justine Sharrock, that we are able to see how much distress comes from abuses soldiers commit either as a result of commands from superiors or due to the morally disorienting effects of ambiguous combat situations. Indeed, among the most traumatic psychological scars that soldiers sustain are those resulting from what they have done to others. Some of the particularly intense characteristics of PTSD are found among perpetrators. As Col. Dave Grossman and others have described, human beings have an inherent resistance to killing other human beings. As a result, waging war almost always relies upon propaganda and training designed to dehumanize the enemy and elevate one's own cause. Psychology and psychologists have contributed to training programs aimed at increasing soldiers' willingness to kill. Now, this newest positive psychology program for resilience promises to shield soldiers from some of the debilitating consequences of their actions and, as Reivich, Seligman and McBride note, it aims to better enable soldiers to "live the Warrior Ethos – 'I will always place the mission first. I will never accept defeat. I will never quit. I will never leave a fallen comrade'" (p. 27). Missing, it would seem, is any meaningful CSF component devoted to helping soldiers grapple with the profound ethical dilemmas involved in their duties, including killing others in furtherance of state policy. Brett Litz and his colleagues have used the term "moral injury" to describe the exceedingly difficult challenges and consequences that soldiers face in response to "perpetrating, failing to prevent, bearing witness to or learning about acts that transgress deeply held moral beliefs and expectations" (p. 700). These are especially troubling omissions from the CSF program when we also consider the regrettable reality that many recruits, often drawn to the military by economic necessity and deceptive marketing strategies, are never told about the types of injuries to which they will be exposed or the level of slaughter in which some of them will take part. In the closing article of the special issue, Seligman and Fowler (former CEO of the APA) attempt to counter the objections they anticipate from readers who have concerns about how closely the APA and the profession of psychology should align themselves with the agenda of the US military. Certainly, such reader concerns are not entirely unfounded, especially given the tragic repercussions of the APA's decisions post-9/11 to shape its ethics code, policies and pronouncements to meet the perceived needs of an administration that viewed torture and other detainee abuse as legitimate components of national security practice. Unfortunately, however, Seligman and Fowler's arguments serve only to instill greater concern about the foundations of the CSF program and the role of institutional psychology in advancing it, as we explain below by responding to three statements from their article. "It is not the military that sets the nation's policies on war and peace. The military carries out the policies that emerge from our democratic form of government. Withholding professional and scientific support for the people who provide the nation's defense is, we believe, simply wrong" (p. 85). No one recommends withholding services from anyone in need. Indeed, health professionals deserve to be commended for providing such support to our soldiers and veterans. But when acting ethically, health professionals address the needs of their clients before the wishes of the institutions that hire them. Therefore, if those institutions constrain the options available for the well-being of the practitioners' clients, these professionals have an obligation to consider remedies beyond the narrow institutionally defined interests. 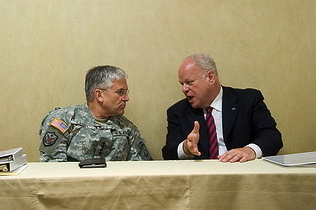 For example, the CSF program does not include a component whereby participants are invited to listen to fellow soldiers and veterans who have enhanced their own safety, well-being and sense of purpose by refusing to comply with illicit orders, or by deciding, as have so many other American citizens, that the war they are fighting is unjust and immoral. In addition, whether the US military plays a role in establishing policies is not a matter to be determined by recitation of formal rules. Scholarship involves an obligation to look at the actual evidence. Generals routinely make political statements in which they advocate for the latest war. Major military contractors work closely with military officials to sell both weapons of war and war itself. Retired military officers are then often hired as lobbyists for these same corporations and some appear as military "experts" in the media without revealing their conflicts of interest. The exorbitant budget for "perception management" services paid to professional propaganda organizations is also used by the military to spin news and promote war to government officials and the public alike. And, as recently reported by Rolling Stone, psychological operations ("psyops") techniques were used by the military on visiting US senators to strengthen their support of the increasingly unpopular Afghan war effort. "The balance of good done by building the physical and mental fitness of our soldiers far outweighs any harm that might be done" (p. 86). It is disappointing that researchers who have emphasized the purported empirical underpinnings of the CSF program would here abandon all semblance of scholarly rigor. The authors offer their cost-benefit claim as transparently true (i.e., the good outweighing the harm). But they offer no evidence in support of this crucial claim. For example, in their calculation, how much weight do they give to the tragic numbers of civilian casualties in Iraq (minimally estimated in the hundreds of thousands) and Afghanistan – the dead, the injured and the displaced? Does this harm matter at all to those promoting CSF? Have we reached the point where "do no harm," the fundamental principle underlying the psychology profession's ethics, has become "do no harm to Americans, unless it serves the interests of the state"? These issues deserve careful consideration, not evasion. We should also keep in mind that every effort to support military operations is billed as "support for our troops." Whether it is the use of drones that kill from a continent away or tapping into a soldier's capacity to kill without a serious hangover, all are justified as for the brave troops. But the decisions to use military force are not made with the well-being of military personnel in mind, nor are they made by soldiers or even influenced by their desires. Master resilience trainers in the Army will not be urging soldiers to report violations of the rules of engagement by their superiors. They will not encourage soldiers to empathize with the humanity of the adults and children whom they may have killed as collateral damage, nor to use forms of restorative justice for apology and reconciliation that have a potential for deeper healing. And they will not encourage troops to build supportive ties with those critical of the wars they are fighting or the tactics required of them. "We are proud to aid our military in defending and protecting our nation right now and we will be proud to help our soldiers and their families into the peace that will follow" (p. 86). The blind embrace of overly simple notions of "patriotism" is inappropriate for professional psychologists dedicated to the promotion of universal human health and well-being. Ideological convictions based upon mythologies of American exceptionalism are no substitute for an examination of their verity. If it is not true that the US is defending its democratic foundations against ruthless adversaries, then the balance shifts dramatically toward averting the alleged harm of making healthier killers. By tying the CSF program to claims of the rightness of American military goals and actions, Seligman and Fowler are, unrecognized by them, requiring that an ethical evaluation include a comprehensive empirical evaluation of the justification for those policies. Such an evaluation likely will find that the view of US military history as being primarily "defensive" in nature, rather than one of imperial control, is false. Rather, the US has a long history of intervening in other countries and overthrowing their governments when they act in ways considered to be against US national interests. Where does the "defending and protecting" reality lie in regard to the war in Iraq or the invasion of Grenada or the support for the Venezuelan coup or the bombing of Serbia or military aid to dictators around the world? Sadly, history (and scholars such as retired US Col. Andrew Bacevich, among many others) has shown how remarkably war-prone the United States has been in the nondefensive pursuit of its foreign policy and "national interest." The US is, in fact, at best only inconsistently a defender of democracy. Our empire-building behavior has caused great harm to our own safety and well-being – and to the principles our country purports to value. Meanwhile, the promise of peace following military victories has surely not materialized, while the case for the extent of US engagement in wars that were unneeded is extensive and compelling. It is not professionally responsible to ignore these facts. In addition to our deep concerns about CSF, the APA's unrestrained enthusiasm for the program is especially worrisome for what it says about the APA, the largest organization of psychologists in the country, indeed the world. As we have demonstrated, there are many complex issues regarding the CSF program's empirical foundations, its promotion as a massive research project absent informed consent and the basis on which its psychologist developers justify the program. We would, therefore, expect a special issue of the American Psychologist, a journal edited by the APA's CEO Norman Anderson, to encourage an extended discussion of these matters. In contrast, guest editors Seligman and Matthews have assembled 13 articles that include no independent evaluation of the empirical claims underlying CSF. They contain no unbiased discussion of ethical issues raised by the program. They do nothing to enlighten psychologists about ethical challenges posed by consulting and research work with the military. And they most certainly offer no encouragement for questioning the foreign policy context in which our soldiers are sent into combat, to face physical and moral hazards for which even the best program can never adequately prepare them. Unfortunately, the APA's uncritical promotion of the CSF program reveals much about the current moral challenges facing the psychology profession itself. Psychology should maintain an ethical and critical stance distinct from and resistant to the lure of patriotic calls, which are part of each and every military undertaking – by all nations – regardless of the legitimacy of the cause. As psychologists, we should tread carefully when our efforts are solely directed toward sending soldiers back into combat rather than counseling them away from participating in misguided wars. In a similar way, assessing soldiers for their potential to withstand such horrors of war and building their resilience through teaching mental toughness skills are not necessarily healthy alternatives compared to affirming and assisting them in their expressions of doubt and dissent. Ultimately, there is a paradox that should be foremost in the minds of professional psychologists. Helping people who have already been harmed by trauma is essential. But should we be involved in helping an institution prepare to place more people in harm's way without careful and ongoing questioning and review of the rationale for doing so? Whatever the needs for a military for national defense or the benefits of team building, loyalty, camaraderie and a positive outlook, militaries are, among other things, authoritarian institutions that kill, maim, deceive and actively reduce an individual's sense of independent agency. The enormous toll that armed conflict exacts on soldiers, veterans, families and communities is a key reason why we should send young men and women to war only as an absolute last resort – and we should bring them home as quickly as possible, rather than sending them back again and again. If the CSF program is truly about enhancing well-being, then we should also question whether these soldiers might be helped more effectively by finding non-military ways to resolve the conflicts and concerns for which they carry such heavy burdens. NOTE: This essay has also been published online by Truthout, Counterpunch, and ZNet. Roy, I totally agree with you. I have submitted a comment to AP but doubt it will be published. Take a look at my two websites, http://www.democracypowernow.com and http://www.uschamberofdemocracy.com to see what I have been up to lately. as a Euopean shrink, who was her whole life also in Human (and patients’) Rights, I could not agree more with your view; prevention of war would be a good alternative, as is prevention of torture; International Humanitarian Law (Geneva Conventions, “Wars – law”) look after respect of “law” in armed conflicts, however it would be better to train politicians to consider war – and torture- as inacceptable last resorts in the pursuing of Peace and Happyness of all Human Beings.